The newborn conjoined twins trapped in the Yemeni capital Sana'a died on Saturday while waiting to be transferred abroad for lifesaving surgery, Yemeni health authorities said in a statement, as the war-ravaged country could not provide any help as its health system has totally collapsed because of the Saudi-led assault. Faisal al-Babily, the doctor for the twins, told the Reuters news agency that medics were not able to perform even basic diagnostic tests such as an MRI scan in Yemen, and certainly did not have the capabilities to separate them, if needed. "They will not be able to survive in Yemen under the social, political and economic circumstances in this country," he stressed. Saudi Arabia claimed on Wednesday that it is making "arrangments to transfer the twins from Sana'a to the kingdom as soon as possible" to receive treatment. However, Babily told Xinhua news agency a few hours later that the hospital "has not yet received any response from the United Nations or the countries of the Saudi-led coalition to transport the boys who may die within upcoming minutes". "The twins' health has been worsening and they are taking their last breath," al-Babily, also head of Paediatrics of al-Thawra hospital where two-week-old Abdulrahman and Abdulrahim al-Haymi died, stated. "Since the birth of the twins, we have repeated our appeals to the United Nations, international organizations and the countries of the Saudi-led coalition to immediately help allow the evacuation of the twins to any medical center abroad for urgent treatment," he lamented. 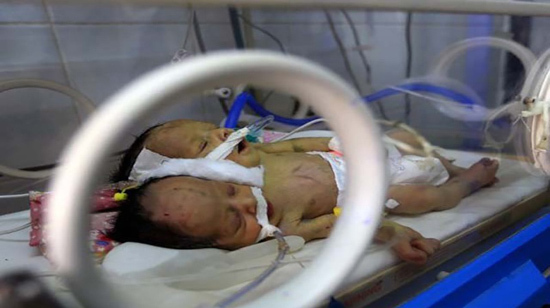 Local health authorities blamed the Riyadh-led coalition for the "tragic" death of the conjoined twins, appealing for international pressure on the coalition to promptly end its blockade on Sana'a airport. Sharing a liver and a kidney and with separate hearts and heads, the conjoined twins had been fighting to survive for more than a fortnight since birth. Also, the World Health Organization has announced that 35,000 Yemenis have cancer, and 11,000 are diagnosed every year. But increasingly, cancer clinics have been closing, leaving patients without access to treatment and care. Already facing travel in dangerous areas, long wait times for care, and limits on crucial food and medical supplies imposed by the Saudi-Emirati coalition, cancer patients in Hudaydah now have no idea if the last clinic in the area will still exist for their next treatment. Potable water has also become increasingly hard to come by in Yemen since the war started in 2015, highlighted by the nation's cholera outbreak. According to the UN, two-thirds of the population of the war-torn country do not have access to safe drinking water. Collapsed infrastructure coupled with a partial blockade has also deprived most of the population of clean water and proper healthcare, while unleashing the worst cholera outbreak in modern history. The Saudi-led aggression has so far killed at least 20,000 Yemenis, including hundreds of women and children. The violence has also left around two-thirds of Yemen’s population of 27 million relying on aid amid an ongoing strict naval and aerial blockade. According to the world body, Yemen is suffering from the most severe famine in more than 100 years.